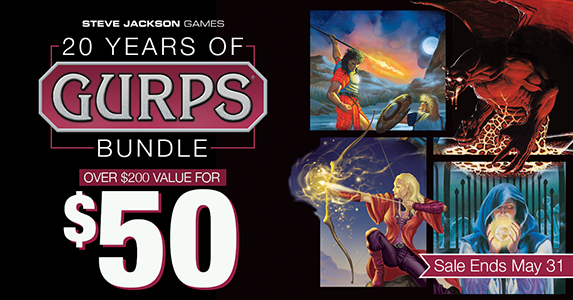 Daily Illuminator: 20 Years Of GURPS Lite, 16 Days Of An Amazing Bundle! May 16, 2018: 20 Years Of GURPS Lite, 16 Days Of An Amazing Bundle! One of the joys of having the oldest blog in the world is that you can reflect on your history in new and interesting ways. For example, 20 years ago today, we wrote about the newly released GURPS Lite. It was the perfect – and free! – gateway to GURPS Third Edition. This was years before GURPS Fourth Edition . . . but when we released that new version, we made sure to offer an updated (still free!) version of GURPS Lite then, too. Since then, Lite has found its way in various forms into many great books, including GURPS WWII, Transhuman Space, and the Vorkosigan Saga Sourcebook and Roleplaying Game. We were brainstorming how to celebrate two decades of introducing GURPS, and we came upon an idea: Why not take a look back at those 20 years and offer a bundle on Warehouse 23 that spans this entire era? Hurry! This amazing deal is only available from now until May 31. Don't delay . . . buy it today!